View of the Urseren, looking toward Realp. By SteveK via Wikimedia Commons. CC BY-SA 3.0. This case study examines the community management of alpine pastures and resources in the valley of Ursern in central Switzerland. Over 90 % of the land in the valley is owned by the corporation Ursern – a community of long-established citizen families. The corporation is responsible for the sustainable grazing of the alpine meadows, owns hydroelectric power stations, deals with the military, which uses the area, and takes care of the avalanche protection together with the municipalities. The corporation is also involved in the local retirement home and the valley museum. Nowadays the corporation faces the challenges of a changing environment and an increased tourism due to foreign investors with both positive and negative effects. Alpine environment in the valley of Ursern. By PetrissaAlexandraVilliger. Own Work. CC BY-SA 4.0. The corporation “Ursern” owns most of the land in the valley of Ursern. The area measures 175 km2 with meadows, forests, rocks, glaciers, lakes and streams. The valley contains three municipalities, which are the lowest level of administrative divisions in Switzerland: Andermatt, Hospental and Realp. The valley Ursern, or also called Urseren, is located in central Switzerland in the canton (“province”) of Uri. It is characterised by a U-shaped profile and a rugged terrain, the elevation ranges from 1400 to 3200 m a.s.l. The Schöllenen Gorge formed by the upper Reuss separates the Ursern valley from the rest of canton Uri. In the west the Furka Pass leads to Valais, in the south the Gotthard Pass to Ticino and in the east the Oberalp Pass to Graubünden. The valley has an alpine climate and is snow covered from November to April. The mean annual air temperature used to be 3.1°C, but raised to 4.6°C in recent years due to climate change. The Ursern valley is affected by avalanches during winter and by landslides in spring and summer. Increased frequency and intensity of rainfall events as an effect of climate change can already be observed and are expected to further increase, so landslide hazard are expected to become an even bigger problem. The vegetation in the valley is shaped by anthropogenic influences due to pasturing for centuries. 63% of the land is covered by grasslands including dwarfshrubs, around 10% is covered by shrubs and trees, most of the other land is covered by rocks or glaciers. Deforestation of the valley started in middle age with the first settlements due to agricultural activities and scarcity of timber. Today’s small forests were cultivated for avalanche protection above the villages. 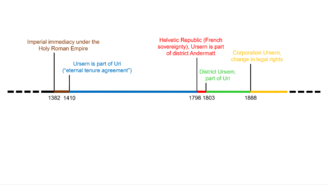 History of the corporation Ursern: different affiliations of the valley over time. By PetrissaAlexandraVilliger. Own Work. CC BY-SA 3.0. The corporation sees itself as the direct successor of former governments. Until 1888 – when the constitution of canton Uri was completely revised – the valley had been a district and therefore a legal administrative division in the canton with its own jurisdiction. The corporation sees itself as the successor of this district and the changes of 1888 as a big loss of power. This is why their history goes back to the Middle Ages. Before 1382 the valley belonged to the monastery of Disentis. 1382 the people in the valley gained bigger independence with the imperial immediacy under the Holy Roman Empire. While the Old Swiss Confederacy was founded 1291, Ursern joined Uri only in 1410 with an eternal tenure agreement (Ewiges Landrecht). With the sovereignty of the French 1798 the valley became an official district that lasted until 1888. Since the medieval ages the muleteers over Gotthard pass became more and more important for the local economy. In the 18th century the villages had 70ish overnight stays from traders per day. The locals participated in the trade with cheese, livestock and crystals. Several fights took place in the valley during the Coalition Wars around the year 1800 (various military alliances against France and its Emperor Napoleon Bonaparte). The first solid street over Gotthard was built 1830. In 1882 the Gotthard train tunnel opened, the trade over the Gotthard pass came to a halt and the valley lost an important income source. Many left the valley. 1888 all the people from Urseren voted against the new constitution of canton Uri, but were outvoted. Around 1900 tourism and the construction of a military basis in Andermatt brought back economic growth. The corporation promoted touristic infrastructure during the Belle Époque. While many hotels had to close during 1st world war, the military remained an important economic factor in the 20th century. The train connections through the Schöllenen Gorge 1917 and over the Furka and Oberalp passes 1926 were very important for the valley. The corporation made efforts so that the trains would also run in winter. 1945 the corporation fought successfully against plans for a big dam that would have flooded the whole village of Andermatt. In the 20th century the corporation had many conflicts with the canton because of such questions. Until 1974 the corporation and not the official municipalities was responsible for the support of poor people in the valley. After 1995 the military started to retreat from Andermatt, many locals lost employment. 2002 the corporation constructed a wind plant on the mountain Gütsch. 2005 Egypt investor Samih Sawiris started with his project for a hotel, resorts, a golf course and investments in skiing infrastructure, this should bring over 2000 new jobs to the valley. The corporation (Korporation Ursern) is an entity of public law and consists of all the valley citizens. They own 93 % of the land in the Ursern valley. The corporation is in its use of the land restricted by cantonal and national law. Forests for example are strongly protected in their size and their use is restricted by federal law. The cantons are responsible for enforcing federal laws within their territory (subsidiarity principle). The corporations Uri and Ursern are autonomous entities of public law. The right to vote in affairs of the corporations is defined by the law of the corporations. The corporations have the right of expropriation. The corporations have the right to give concessions for the search of crystals and for surface mining. The fortune of the corporations remains guaranteed. The corporations support the canton and the municipalities in their tasks and help to achieve the aims of the state. The corporation has a democratic structure: The community (Talgemeinde) elects a legislative (Talrat, “valley council”) and an executive (Engerer Rat, “reduced council”) with the mayor (Talammann) for two years. Once a year in May all the man and women of the corporation meet in front of the Church in Hospental for the elections and for the vote about budget, financial statements, citizenship for new members and new rules. The administrative manager is called Talschreiber. He or she is elected by the Talrat and head of the administration. The administrative manager (Talschreiber) is Georg Simmen. Easy admission to the corporation is only possible for women through marriage. Other people can become a member of the corporation (citizen of the valley) if their family lived in the valley for at least 50 years and they pay a CHF 1’000 (circa CAD 1’330 (Nov 2018)) admission fee. However the corporation is currently thinking about lowering the 50 years to 30 years. The right to exclude outsider had been an important principle in the past because of land scarcity. It is important to understand that Swiss citizenship is traditionally connected to a specific village and only people who are citizen of that village and live in that village are members of local corporations or similar communities. Since most people nowadays do not live anymore in the same village as their ancestors this concept is under increasing pressure. Besides the management of alpine pastures the corporation keeps and manages electricity plants, a museum, a sports ground, a new retirement home, streets, hiking trails and avalanche protections. They also give concessions for the skiing infrastructure, for example cable cars. Cows on alpine pastures in central Switzerland. By kahsky via Pixabay. CC0. The management of Alps is one of the main tasks of the corporation. They have the competence to make and enforce rules for that purpose. Private land was used as hay meadows, but haying was also allowed on other pasture types in specific times of the year. In these very steep areas haying is only possible manually and needs a lot of manpower. In the last decades, especially since the 1960s, these traditional ways of management disappeared: There are no more goat pastures, the land use type called “Freiberg” almost disappeared and the higher alpine cattle alps disappeared completely and gave way for sheep pastures. While remote and less productive areas were abandoned the land use of nearer pastures was intensified due to an increased number of cows and especially sheep. Less manpower for more cattle and sheep is financially worthwhile. The relevance of farming gradually decreased during the last decades and also the number of full time farmers and farms decreased. Permanent herding was replaced by uncontrolled grazing within fenced pastures, where animals concentrate on single locations. Steep areas that are difficult to access and that have formerly been mown by hand (wild haying) were converted to pastures. Number of external pasture animals delivered from the low lands outside of the valley increased. Compulsory labour that was spent for the maintenance of the pastures was abolished. The land use type “Freiberg” was largely abolished, areas are now pastured throughout the entire season. The private land is nowadays more frequently mown with machines and intensely fertilized with organic manure. 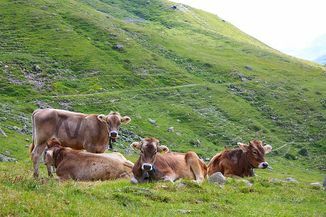 The stocking on the alps with dairy cows was reduced because of increased mother cow husbandry. The shrub cover increased due to cessation of wild haying, firewood collection, and reduced stocking of the alps with cattle and goats. The number of farmers declined from 77 in 1970 to 31 in 2006 and there are less full-time farmers. Nowadays however the trend of more cattle from the low lands has already changed because modern high-performance cow breeds are often not suitable for grazing in the alps. This is a challenge for the corporation. A current conflict has emerged due to more sheep and less shepherds while the number of formerly extinct wolves finally recovers. Due to abandonment of pastures and to active reforestation, the timber reserves have accumulated in the last century. The main affected stakeholder is the corporation itself. However the corporation could be further divided into normal members and members of the different councils. Not all the members in the corporation have the same goals and views, but they all feel a deep binding to the land and their shared history. Also strongly affected are the local municipalities. The municipality councils have to deal with the corporation council and sometimes this leads to serious disputes about rights and finances. While all the members of the corporation are also members of one of the municipalities, not all inhabitants of the valley are also members of the corporation. These non-members can be highly affected stakeholders without access to corporation rights. It depends on the circumstances: Some people live in the valley for a short time for example as seasonal workers for hotels and have no interest in long-term integration. For others however the valley become their new home and they suffer from the exclusion. 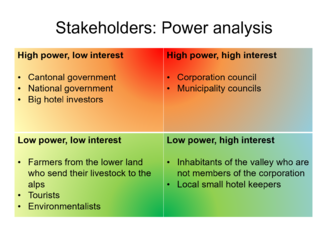 Power analysis of stakeholders in the valley of Ursern. By PetrissaAlexandraVilliger(Own Work). CC BY-SA 4.0. Depending on the topic interested stakeholders are the cantonal government (e.g. environment, constructions, law and order) and the national government (e.g. military base, Gotthard tunnel). Farmers from the lower land who send their livestock to the alps during summer are interested in the management of the pastures and in wildlife management (wolf). Hotel keepers and investors are highly interested stakeholders and can – depending on their individual situation – also count as affected stakeholders. To mention is Samih Sawiris who invests an enormous amount of money in Andermatt for resorts, hotels and touristic infrastructure in general. Interested in the development of the valley are also the tourists. Some of them own a vacation home in the valley or are guests returning every year. They develop an emotional binding to the valley and it may become their second home. 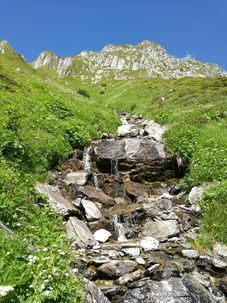 Regarding the dispute about the wolves and the fragile alpine environment in general, environmentalists are interested stakeholders as well. They may be represented with an NGO like WWF Switzerland or ProNatura. Since the corporation has a long history, the aims changed over time and are disputed within the members of the corporation nowadays. However the main goal can be formulated as the sustainable use of the valley and its natural resources along with the social welfare of its inhabitants. In recent years the economic situation could be enhanced due to investments in touristic infrastructure. The construction of a local retirement home was also welcomed by the locals. However some people fear that the big changes destroy the current qualities and the atmosphere of Andermatt. Suffering from the economic growth does the environment and the farming. New skiing facilities and a golf course were built, which destroyed the alpine pastures and plant communities there. A growing touristic infrastructure is often not compatible with current farming practices. The increasing risk of natural hazards due to climate change and intensification of certain areas will be a challenge, especially with more tourists in the mountains. As long as the corporation stays open to scientific advise and new approaches it will be possible to find solutions for these problems. Sheep on high alpine meadows in Uri. By PetrissaAlexandraVilliger(Own Work). CC BY-SA 4.0. In the future the production of artificial snow will increase because of climate change. This requires a lot of energy and water. The corporation tries to cover the electricity demand with wind and water power. These power plants are good for the climate but disturb the local wildlife (e.g. birds). So it seems that the current changes of the valley are not sustainable from an environmental view. Another environmental challenge the corporation has to deal with is the increasing presence of wolves in the valley. The corporation is against the wolves because they say the animals are not good for sheep breeding and tourism. While the first is obviously true because the protection of sheep is expensive, the latter is probably wrong. Most Swiss people from the low lands – in contrast to the farmers in the mountains – are in favour of wolves. They go to the mountains to enjoy nature and wildlife. Only encounters with shepherd dogs can be a problem for tourists. 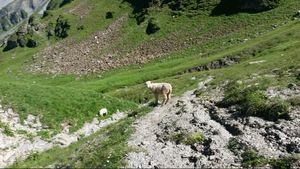 Because there was one verified case of an attack in the Ursern valley, the corporation banned shepherd dogs in the whole area after 150 inhabitants demanded it from the council in 2018. The locals were also against the shepherd dogs because they killed a goat that accidentally walked into the sheep flock. However I think that was the wrong move, because in other areas with similar conditions they found solutions: Tourists are informed about the correct dealing with shepherd dogs, aggressive shepherd dogs are replaced and sometimes hiking trails are relocated. Switzerland does not yet have a long experience with the co-living of wolves, cattle and people, so it is not surprising that in the beginning there may be some throwbacks. But a ban of shepherd dogs causes major problems: Because building a pen every night or guarding the sheep by people is very laborious, some sheep owner now don’t protect their sheep at all. This may cost many sheep life in the future and cause new resentments. An ongoing, but not yet dramatic development is the decreasing number of members. To solve that the corporation wants to facilitate a bit the naturalization of new citizens. Conspicuous is the fact that there are only men in the valley council and in the administrative management. It would be good to encourage women for the executive as well. Technically the corporation is no longer needed in the valley because its tasks could also be accomplished by the municipalities with the benefit of including all inhabitants in the decision-making. However the corporation has shown in the past that they too are able to handle economic and social challenges. Most important is probably that the corporation is supported by its members. They identify with their home through the corporation and it gives them a feeling of independence. In contrast to other places in Switzerland there is no discussion in the corporation itself about liquidation. This is also due to the strong interest in their own history: The corporation initiated a research project (analysing the archive of the valley) by the University of Basel in 2003. Inhabitants are very interested in these findings and despite major changes in the past people have a strong sense of independence and historical continuity. I think the corporation is on a good way concerning social and economic challenges: Especially the facilitation of the naturalization for new citizens is a good idea. It is important to integrate the motivated non-members in activities of the corporation to prevent conflicts. With regard to wildlife I think it would be good to countermand the ban of shepherd dogs because wolves will return to all part of the mountains anyway and it is illegal to kill them. Tourists can learn how to deal with shepherd dogs and shepherd dogs can be better trained. To prevent natural hazards it is important not to further intensify areas closer to the valley floor. Forested land and abandoned land with a growing shrub cover is better protected from landslides and avalanches, so the abandonment of remote areas is not a problem from an environmental point of view. Generally adapting to change is probably the most important as Jeanraud (2001) observes: “Evidence from the European case studies indicates that CIFM [Community Involvement in Forest Management] has thrived where a viable economic base is supported by common ethical and cultural values. However, in order to remain viable and robust, successful communities have been flexible and open to new opportunities, and adopted many progressive policies and practices." ↑ 2.02.12.22.32.42.52.62.7 Alewell, C.; Meusburger, K. (2008). "Impacts of anthropogenic and environmental factors on the occurrence of shallow landslides in an alpine catchment (Urseren Valley, Switzerland)". Natural Hazards and Earth System Sciences. 8: 509–520. doi:10.5194/nhess-8-509-2008. ↑ 3.03.13.23.3 Kägi, H.U. (1973). Die traditionelle Kulturlandschaft im Urserental: Beitrag zur alpinen Kulturgeographie. Zurich: University of Zurich. ↑ 5.005.015.025.035.045.055.065.075.085.095.10 Schaffner, M. (2007). "Die Korporation Ursern zwischen Beharren und Fortschritt: Vorläufige Bilanz eines Archiv- und Forschungsprojektes". Histoire des Alpes = Storia delle Alpi = Geschichte der Alpen. doi:10.5169/seals-12747. ↑ 7.07.17.27.37.4 Personal communication with Georg Simmen (e-mail), 27.10.2018. ↑ Netting, R. (1996). "What alpine peasants have in common: observations on communal tenure in a Swiss village". In Bates, D.G. ; Lees, S.H. Case Studies in Human Ecology. Boston: Springer. doi:10.1007/978-1-4757-9584-4_9. ↑ 9.09.1 Bisang, K.; Kissling-Näf, I.; Volken, T. (2002). "Common property and natural resources in the Alps: the decay of management structures?". Forest Policy and Economics. 4: 135–147. doi:10.1016/S1389-9341(02)00013-8. ↑ 11.011.1 Jeanrenaud, S. (2001). Communities and forest management in western Europe: a regional profile of WG-CIFM the working group on community involvement in forest management. Gland: IUCN. This conservation resource was created by Petrissa Villiger. It has been viewed over 0 times. It is shared under a CC-BY 4.0 International License. Post image: By Unknown. Public Domain.